Not quite what I expected when I saw "cordless" in the description but the Cuisinart KUA-17 Automatic Electric Kettle is still an interesting convenience item for dorm or office desk. With a 1 3/4 quart capacity and stainless steel pot, this portable kettle can be a source of hot water for tea and instant coffee as well as bouillon and packet soups. The pot is not a cordless appliance--tea kettles run by microwave beam technology are apparently still only alive in my imagination. The heating element base runs on an ordinary power cord. The "cordless" aspect is that the pot sits on the heating pad, lifting off for pouring. The base turns off when the pot is lifted and turns on again when the pot's weight activates the unit. There are some things which can go wrong. 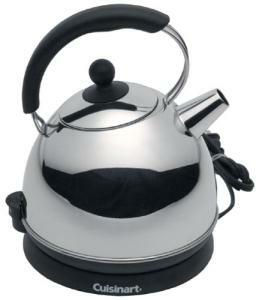 An empty pot will trigger the heating circuit, so when not in use, unplug the base. Water should not be left in the pot according to the manufacturer, but since their explanation of that makes no sense to me, I will not add it here. Just don't do that. The pot has to be set correctly on the base or the platform will not depress and turn on the circuit. The contacts inside the heating pad are prone to wear and tear--each time the circuit turns on and off there's a spark that erodes the points and eventually the base will no longer activate. The generous three year warranty Cuisinart now provides goes well beyond the most common trouble point, which should do a lot to increase consumer confidence. Here's another electric kettle to consider by Chef's Choice.